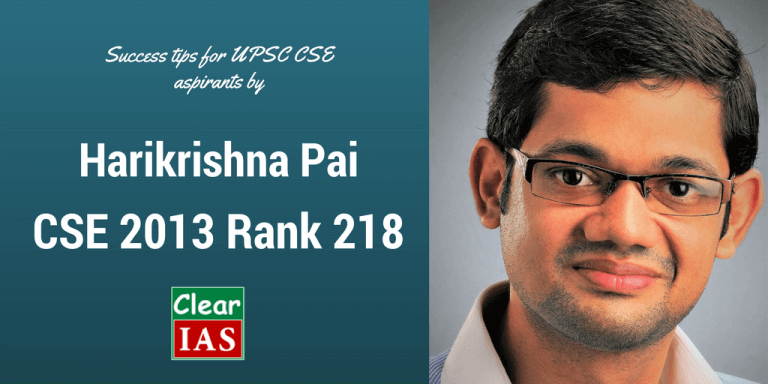 This is the last part of the detailed interview of Harikrishna Pai (CSE 2013 Rank 218) in ClearIAS.com’s UPSC Topper’s Interview series. Hari has already shared his background, approach, preparations strategies, books referred, UPSC interview etc in the previous parts. In this 5th part, he answers queries about his backup plans, previous attempts, work experience, detailed marks etc. And finally, he winds up the long interview, sharing some important success tips. ClearIAS.com: What was your backup plan in case you didn’t qualify? Sorry to ask, a question just for curiosity, in case if you didn’t improve your last year performance this time, what would have been your decision? I would have definitely given more attempts, as this was my first one. But truly, uncertainty is a rule in this exam, so I had affirmed that, even though I don’t succeed, I need not feel let down. In that case, I would have opted to teach, a job which I always like to do. I wrote Staff Selection Commission Combined Graduate Level Examination. Qualified for mains, but the infamous exam was eventually cancelled (L). Mains: Please also indicate the approximate number of attempts in each General Studies paper and the optional paper. For how many marks did you attempt in each paper? My preference was IAS>IPS>IFS>IRS(C&CE). I preferred IAS & IPS as they offer more opportunities, diversity & challenge. After the results came out, I got the opportunity to mingle with lot many people. Further, I too try to realise the responsibility that we are supposed to take. The best part after the result is to see our loving ones happy and proud. UPSC exam is qualified by many people who represent the broader spectrum of the society. Financial and other issues may definitely put additional pressure, but many people who qualify too have overcome the same through some alternatives. It is better to have a balanced view on our priorities in life. 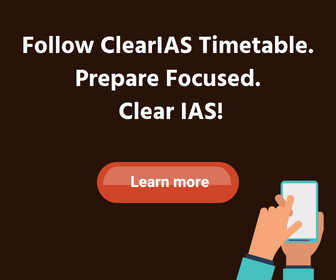 Civil Service Exam preparation definitely needs time investment. But this need not diminish other things in life completely out of the picture. Find time for other things also, without losing focus on preparation. After all, success in any competitive exam need not make you successful in your life. Learn to prioritise things accordingly. Those who opt themselves for this career are opting a challenging path – of which, the exam is only a part. So gather the strength to surge ahead. Be accommodative of new ideas. Don’t see this as a test of pure academic excellence, which is only one among many aspects that will carry you forward. No advice. I think that people who can realise what went wrong and correct it need no advice. Such people will definitely emerge much more superior, even above today’s chart makers. Best is yet to come for them. My prayers and wishes to all dear friends, who are yet to begin, or couldn’t make it this time for some reason or sheer misfortune. ClearIAS.com: We would like to express our heartiest congratulations once again for this grand success. We feel proud that you choose ClearIAS.com and our readers to share your happiness on this special occasion. ClearIAS.com sincerely thank you, on behalf our readers and ourselves, for the spirit and benevolence to find time to write answers to our detailed questionnaire. Wishing you, all the very best in career and life.